Our goal is to offer friendly, client-centred services that are designed to provide our clients with practical solutions. 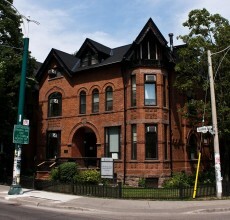 Downtown Legal Services is both a community legal clinic and a clinical education program, operated by the Faculty of Law at the University of Toronto. Our free services are provided by law students, who work under the close supervision of our expert staff lawyers. Approximately 140 law students work at the clinic every year, enabling us to serve over two thousand people. Our goal is to offer friendly, client-centred services that are designed to provide our clients with practical solutions. At the same time, our clinical education programs allow students to learn in an intellectually lively environment, where they can acquire the professional skills and insight to become successful lawyers. We also have three satellite clinics at MealTrans, the Fort York Food Bank and Evangel Hall where our students go to provide services in community locations that offer other supports such as food, shelter, and health care. DLS has a long and rich history of student involvement in the clinic. Every year, a group of students are elected by their fellow students to serve as members of DLS Executive. This committee, which also includes DLS staff, meets regularly to discuss clinic programs, review policies and consider special projects.